Make sure you know how to get to the interview location. Know the name, title and position of the interviewer. Get a contact number (or numbers), in case something happens. Know your route and how long it will take to get there in traffic. Make sure your clothes are clean, pressed, and free of stains or tears. Clean and organize your brief case. Carry only what is NECESSARY. 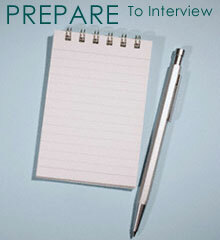 Get plenty of sleep the night before the interview. Wake up early, to give yourself extra time.